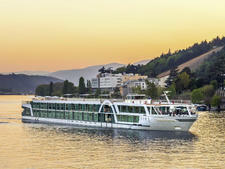 In addition to the first indoor pool in the fleet, Amadeus River Cruises' 018 flagship Amadeus Queen showcases a new-to-river design to enable the ship to continue sailing when other vessels are affected by high water levels in Europe. The 162-passenger vessel is the 14th addition to the Austrian-owned and family-run Amadeus fleet, which will expand again in 2019 with the addition of sister ship Amadeus Star. 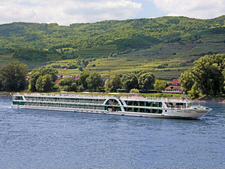 Most modern European river cruise vessels conform to a maximum length, width and height in order to fit into locks and sail under bridges. With an increasing number of sailings in recent years affected by high water -- the result of heavy rainfall or melting snow and ice in springtime -- the Amadeus Queen is 5.9 inches (15 centimeters) lower than mainstream ships. 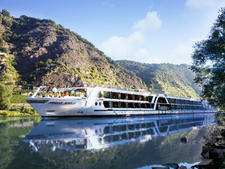 It is the first riverboat to be constructed to these specifications at the De Hoop shipyard in the Netherlands, which has built river ships for Amadeus River Cruises for 20 years. The line is confident that when other ships have to curtail voyages because they cannot sail beneath bridges, itineraries on the Amadeus Queen will be unaffected. 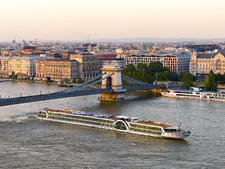 Amadeus is one of the oldest river cruise companies in Europe. 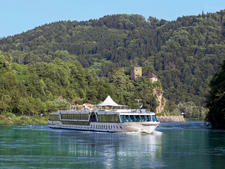 Martina and Wolfgang Luftner launched river cruise vacations more than 30 years ago and in recent years the company has been marketing its cruises in the U.S., U.K. and other countries. English is the main onboard language. Aside from the new indoor pool, Amadeus Queen features trademark amenities that can be found on other vessels in the fleet; some of which are a rarity on all but the most expensive river cruise ships. These include walk-in closets in all cabins, a hair salon, massage room, gym and late-night snack. The stylish vessel, with an interior design personally overseen by Martina Luftner, has 69 standard cabins, mostly with panoramic drop-down windows and French balconies, and 12 suites with walk-out balconies. 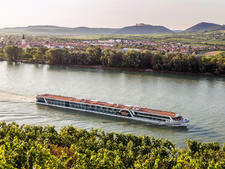 When it comes to dining and excursions, Amadeus has two notable differences from most river cruise lines. Meals are fixed seating, with tables assigned at the beginning of the cruise, and excursions are offered on an a la carte basis (aside from some group booking packages when they are included in the fare). The latter results in value-for-money fares that are significantly less than other lines including one or more daily trips. Passengers can decide how much, or how little, they want to do and prebook a variety of land tour packages or purchase excursions onboard. This is a great deal for independent travelers who prefer to explore cities by themselves or those who prefer to relax onboard and dip in and out of the occasional excursions. The main onboard language is English, and all crew members are very well trained and offer high levels of personal service. As Amadeus Queen carries up to 30 fewer passengers than vessels of a similar size, passengers can expect the bartender to remember their favorite cocktail and wait staff to be aware of likes and dislikes, very early in the cruise. 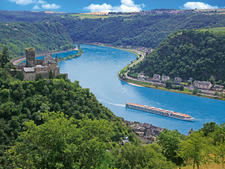 Amadeus Queen sails on a variety of itineraries on the Danube, Rhine and Main rivers as well as Dutch and Belgian waterways. 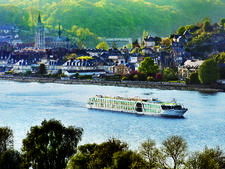 In addition to its Austrian homeland, Amadeus markets its cruises throughout Europe and English-speaking countries around the world. As a result, the onboard vibe is much more cosmopolitan than lines that, for example, cater predominantly, to North Americans. You can expect to sail with Brits, mainland Europeans, South Africans, Israelis and more, which results in plenty of interesting conversations in the bar and lounge as everyone gets to know each other. 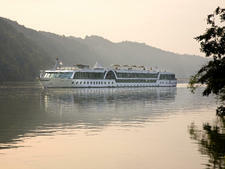 In common with other river cruise lines, passengers are mostly 55+ and seniors. Amadeus is popular with groups but there are always plenty of couples and a sprinkling of solo travelers. There is no official dress code, however passengers are asked to wear "smart" attire for dinner. As a result, people tend to dress up rather more in the evening than is the norm on lines catering mainly to North Americans. Similarly, the guideline is "semi-formal" or "smart-casual" for special occasions such as the weekly captain's gala dinner. In general men wore collared shirts -- some with jackets and ties -- for dinner, with dresses, skirts, pants and smarter tops for the ladies. Jeans, shorts and casual pants are worn on shore excursions and comfortable shoes or sneakers are a necessity for walking on the cobblestones and uneven surfaces in historic cities and towns. The weather in Europe is very changeable, even in summer, so it's a good idea to pack layers, hats, sunglasses and a light rain jacket. Umbrellas are provided onboard and can be borrowed for the duration of the cruise. Amadeus fares generally include red and white wine, soft drinks and coffee with lunch and dinner (this can vary on packages booked through different tour operators, so check when making the reservation). There is a complimentary 24-hour self-service tea and coffee station in the Amadeus Club located at the aft of the ship. Passengers are welcomed aboard on the first night with a cocktail and complimentary aperitifs are also served at the captain's gala night. Glasses, rather than bottles, of water are freely available in the Panorama Lounge. Each morning there is a free morning stretching class on the Sun Deck (weather permitting) or in the lounge and passengers can use the fleet of complimentary bicycles on a first-come, first-served basis. These are provided with a helmet and a lock. All excursions are conducted with audio headsets so passengers can hear what the guide is saying without having to cluster around. These listening devices and earpieces are provided in every cabin. 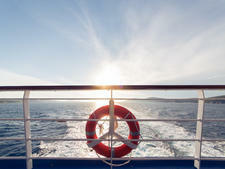 The euro is the onboard currency on Amadeus Queen. Gratuities are not included in the fare and the recommended guideline is 5 to 7 euros per person, per day. At the end of the cruise, there is a tip box left at reception, with envelopes for gratuities left in the cabin. Passengers can also tip individual members of the crew directly for outstanding service. Although it is not common practice with European passengers, North Americans might want to carry some small denominations to tip local guides and shore excursion bus drivers. Some cruise packages include complimentary bottled water, replenished daily, and Wi-Fi, so again check at the time of booking.